Please visit Patter's blog HERE so you can read what you has shared and also she has shared a link to a song with very encouraging words. 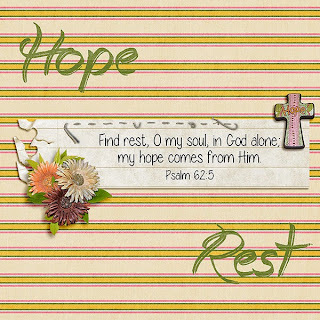 When I went to Bible Gateway to find a verse or maybe two to use in my digital art I found Psalm 62:5 which included both Hope and Rest. It is only the hope we have in our Lord that enables us to rest in Him.